What is the future of banking services in 25 years from now? 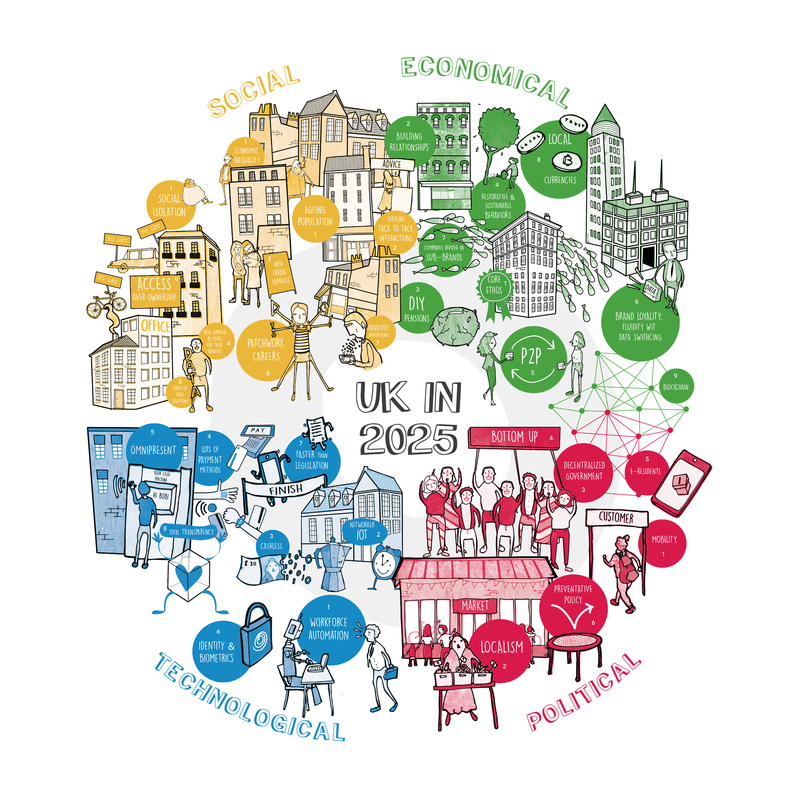 Project analysed the values of current 16-25 year olds in the UK and aimed to translate their existing behaviours into emerging forms of user experiences appropriate to the future context of banking and financial services in the UK in 2025. Research focused on four domains of the future banking: Safety and Security, It’s Your Data, Saving and Spending, New Values. My team worked on the Safety and Security aspects of the brief with a focus on the two ends of the spectrum: feeling of security in the everyday financial interactions and feeling of security in terms of the brand in a wider economic and social context. Our future world representation is a summary of all the research and attempts to highlight future trends in four domains: Social, Economical, Technological and Political. It is a tool which, combined with personas, sets context for the concept development. The main aim was to ascertain how people would react to having increased transparency around the profit made from their purchase. We needed to understand whether our assumption that Generation Y is interested in ethical business would be correct. We aimed to find out whether users felt ‘Trace’ would change their purchasing habits and if so, why. An exploration into how the respondents would react to this as an offering from RBS was also planned. ‘Trace’ was the most overtly ethical idea. Another goal was to determine what is the most relevant aspect for users when they see where their money is going. We wanted to know where their values lie, for example whether they were most interested in locality, Fair Trade, or carbon footprint. We also wanted to know which personas would be interested in the information and its implications. In an increasingly digital world it is important to know what will be valuable in the future and how people’s values will change. The aim of Voice Vault was to discover which digital assets people value now and which they think will be valuable to them in the future. We wanted to explore what other assets the bank could store and whether users felt that this was an appropriate service for a bank to provide. The artefact created a forum for articulating users’ fears around digital data. We used the artefact to discuss what types of conversation people would want to be secured, would it be day-to-day, sentimental or formal conversations for example. We wanted to ascertain how and where users would imagine themselves using the service. We designed the artefact to explore whether a dedicated, tangible object would feel more secure compared to intangible storage like the cloud. 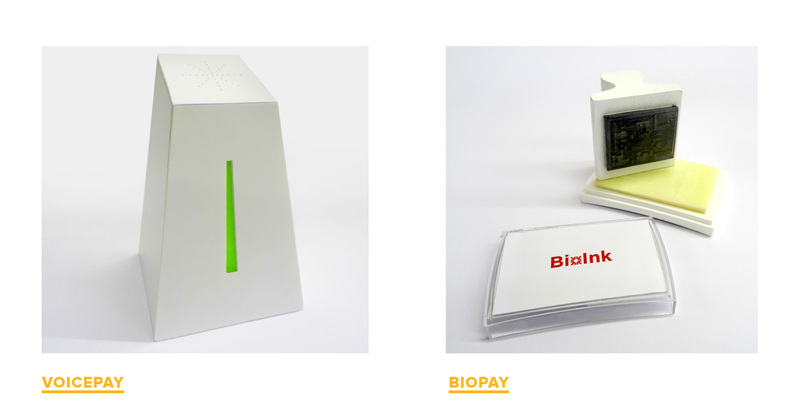 The ‘BioLayers’ station was made up of two payment methods which represented different levels of invasiveness, security, access and privacy. The aim of these artefacts was to determine how different trade-offs of privacy for access would make people feel and what level they would find acceptable. In addition, we wanted to know how people respond to personalised security. This would later inform decisions on what form personalisation should take and how people react to different, biophysical options. VoicePay was the most provocative concept. “VoicePay” artefact involved paying by voice to a device that will speak back to you. The aim of this was to ascertain people’s comfort level around dealing with finance in public places, and how secure they feel about speaking. We also wanted to observe how users would interact physically with a public interface. We predict that in 2025 everyone in the UK has had their unique, vocal pattern recorded. This would allow citizens to pay by speaking into an artificially intelligent payment device in any store. High value transactions also require personal questions. We then showed users a storyboard of a young woman in a cafe using the ‘VoicePay’ to buy her coffee. ‘BioPay’ represented an alternative payment system to ‘VoicePay’ in 2025, we explained it would be an invisible stamp administered to Royal Bank of Scotland customers. Our prototype used UV ink to give an impression of invisibility. When introducing the concept we described how ‘BioPay’ allowed rapid, secure payment by swiping the stamped arm over a price tag to complete a purchase. In our concept the stamp would use ‘BioInk’ to read unique biophysical details such as heartbeat and vein pattern. We told users the ‘BioInk’ would read these biophysical details to confirm a customer’s identity and access their account when they swiped. Users could not imagine how biophysical data such as vein pattern might be used “against” them. All the concepts presented extensively rely on the user research insights and the future trend prediction techniques followed by user testing of the concepts.